I made a touchy-feely playmat for Feets when she was a baby, using rag rug techniques. For Bean, I've been working on a crochet mat. It may possibly be finished before she leaves home, but in the mean time I thought I'd share the work so far! 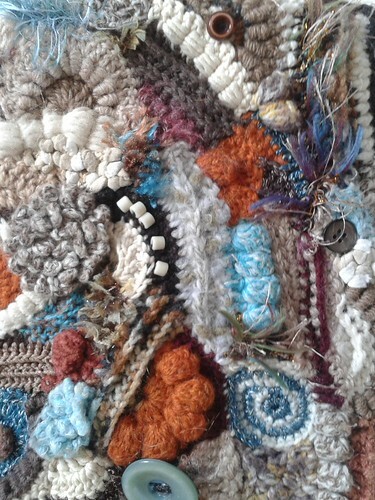 It was inspired by two things ... the need to vacate the artroom and use up all my materials, and by this crochet bag that I was given years ago, which has always inspired me with its 'crazy crochet', varied, textured techneiques. 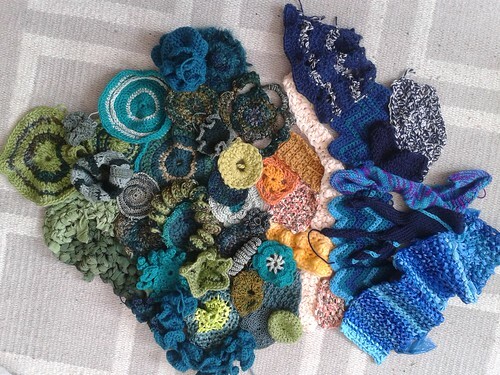 And, actually, by this crochet reef for similar reasons.